Obituary – Ledbetter, James A. « Perry High School Alumni Association, Inc.
Obituary – Ledbetter, James A. Basketball ’20, Athenian ’20, Baseball ’20, Glee Club ’20. James A. Ledbetter, 31, former Noble county judge, and active civic worker in Perry, died suddenly at his home in Perry early Tuesday morning as the result of a heart attack. The young Perry attorney has been in good health, but became ill late Monday evening. Early Tuesday morning he called Dr. D. F. Coldiron and told him he was seriously ill. He was at his home alone, Mrs. Ledbetter visiting in Oklahoma City at the home of her parents at the time. When the physician arrived at the home he found Ledbetter suffering from a heart attack. He told Doctor Coldiron that he had suffered chills late Monday night and that he had a severe pain in his chest. Three minutes later he died when his heart failed. James Ledbetter was born in Newkirk, Okla., Feb. 28, 1904, moving later to Marland and then to Perry while a youth. He graduated from the local high school and received his law degree from the University of Oklahoma where he was a member of the Phi Delta Phi, honorary law fraternity and Acacia, national social fraternity. 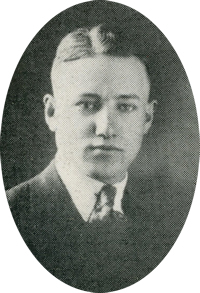 Returning to Perry after completing his training in the university he engaged for a time in the private practice of law, after which he was elected county judge of Noble county in 1928. He ws re-elected to this office for three consecutive terms, serving until January first of this year. He did not see re-election last fall but retired to private practice here and established offices in the Masonic building the first of this year. He has been active for many years in the Masonic lodge here and was a junior past master of the Perry A. F. and A. M. He was also secretary of the Masonic Building association. Ledbetter was a member of the Perry Rotary club and a charter member of the Poor Boys club of which he was treasurer. In addition to this he was an active member of the chamber of commerce, the Noble County Bar association and of the Presbyterian church. Besides his widow, Mrs. Mary Catherine (Moomau) Ledbetter, he is survived by a sister, Miss Isabel Ledbetter of Perry and his grandfather, J. A. Ledbetter of Elizabethtown, Ill., who will be unable to attend the funeral services due to advanced age. Funeral services will be held at 2:30 Wednesday afternoon from the Presbyterian church with Rev. David Thomas, pastor, in charge. Burial will be in Grace Hill cemetery under direction of the Christoph and Newton funeral home. Member of the Masonic lodge will attend in a body and assist in the services.